The National Air and Space Museum’s Steven F. Udvar-Hazy Center will celebrate 15 years of operation Dec. 15. Since opening, it has become a must-see destination and one of nation’s most popular museums. As of Nov. 28, nearly 20 million people have visited the center. The museum will commemorate this milestone with a daylong celebration with activities, expert talks and musical performances. The Udvar-Hazy Center 15th Anniversary Celebration will take place Dec. 15 from 10 a.m. to 3 p.m. and will include musical performances by the Loudoun County Jazz Ensemble, talks by museum experts and book signings. A “Meet the Director” program will give visitors the chance to hear directly from the museum’s new director Ellen Stofan, and Steven F. Udvar-Hazy will be interviewed by one of the museum’s student Explainers. A sampling of items acquired by the museum’s archives and collections divisions will be on display and hands-on activities and story times for children will take place throughout the building. Parking will be free all day. To learn more about the 15th Anniversary Celebration, visit airandspace.si.edu/uhc15. The Udvar-Hazy Center opened in conjunction with the nation’s Centennial of Flight in 2003 and, at the time, had less than 500 artifacts, and only one of its massive exhibition hangars—the Boeing Aviation Hangar—housed displays. 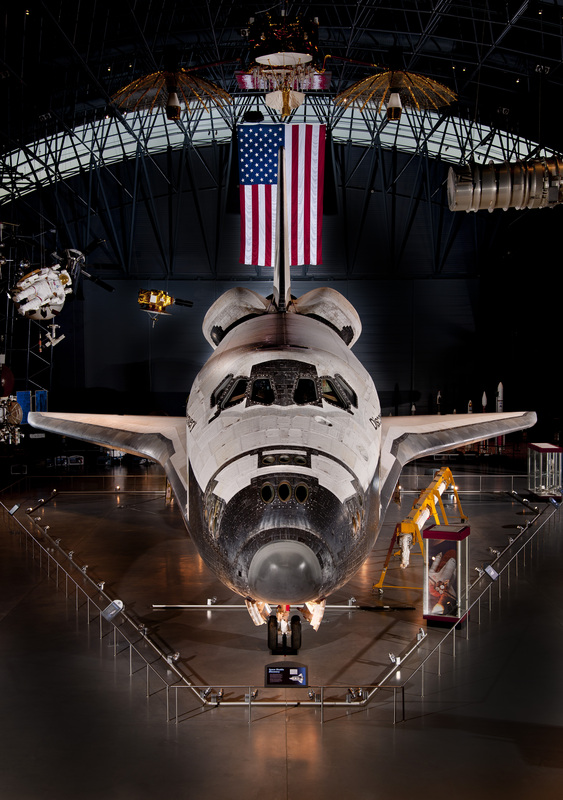 Today there are more than 3,600 artifacts on display, and the James S. McDonnell Space Hangar houses some of the museum’s most important space artifacts, including the space shuttle Discovery. Completed in 2011, an additional wing was completed and houses the Mary Baker Engen Restoration Hangar, the Emil Buehler Conservation Laboratory, the archives and collections storage and operations units. 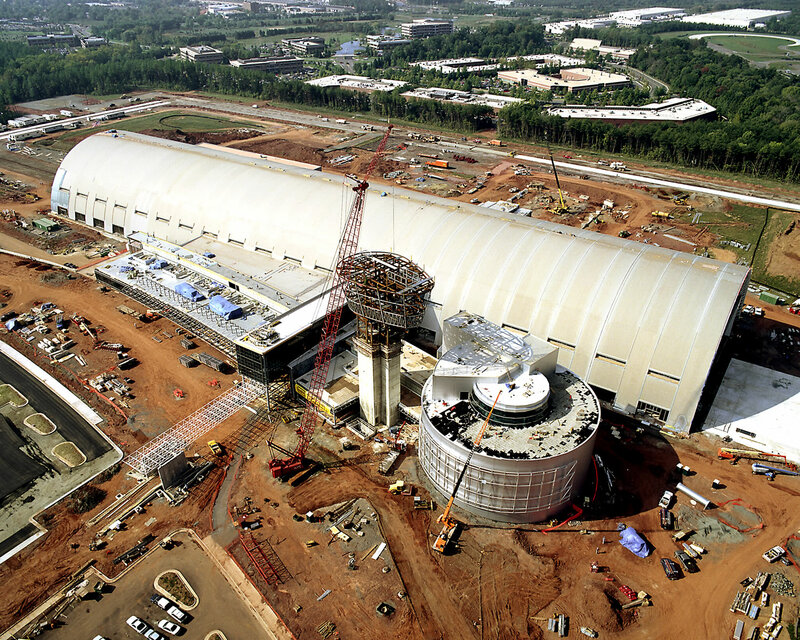 It is the only Smithsonian facility to have been built solely with private funds and is named for aerospace executive Steven F. Udvar-Hazy, who donated $65 million for its construction. The National Air and Space Museum’s Steven F. Udvar-Hazy Center is located in Chantilly, Virginia, near Washington Dulles International Airport. The museum building on the National Mall in Washington, D.C., is located at Sixth Street and Independence Avenue S.W. Both facilities are open daily from 10 a.m. until 5:30 p.m. (closed Dec. 25). Admission is free, but there is a $15 fee for parking before 4 p.m., except Dec. 15, at the Udvar-Hazy Center. 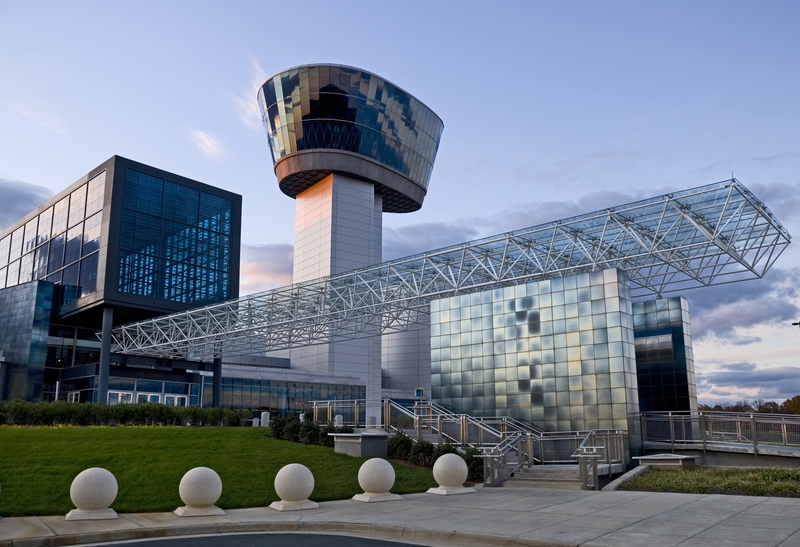 The Steven F. Udvar-Hazy Center near Washington Dulles International Airport is the companion facility to the Museum on the National Mall. The Donald D. Engen Observation Tower and theater in the foreground of the Steven F. Udvar-Hazy Center, October 2002. 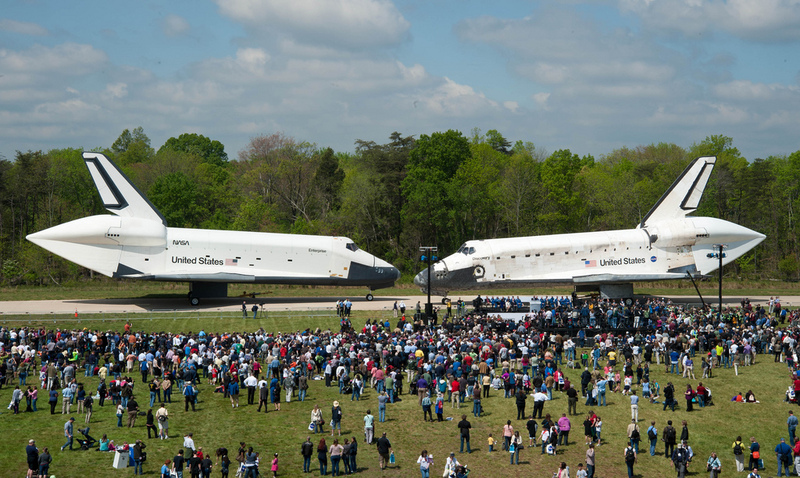 Space Shuttles Enterprise, left, and Discovery meet nose-to-nose at the beginning of a welcome ceremony at the Smithsonian National Air and Space Museum's Steven F.